48" Wide Frosted Glass Privacy Panel Frosted/Painted Tempered Glass Dimensions: 48"W x 5"D x 12"H Weight: 32 lbs. NBF Signature Series, At Work Collection, Dimensions: 48"W x 5"D x 12"H; Weight: 32 lbs. 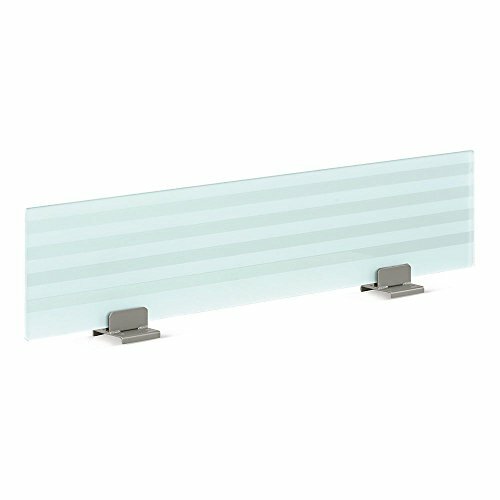 48" Wide Frosted Glass Privacy Panel has tempered glass and is crafted for table desks that are also 48" wide. Frosted print offers interesting design element as well as a measure of privacy; Attaches to table in minutes. Used for NBF Signature Series At Work Collection products;Must purchase two tables and put tables back to back in order for the glass privacy panel to stand on it"s own. If you have any questions about this product by NBF Signature Series, contact us by completing and submitting the form below. If you are looking for a specif part number, please include it with your message.